Previous versions of this document, errata, and a supplement containing addenda a, b, c, g, h, i, j, k, l, m, n, p, q, s, t, u, w, y, ad, and aw, are available under the Product Family tab. 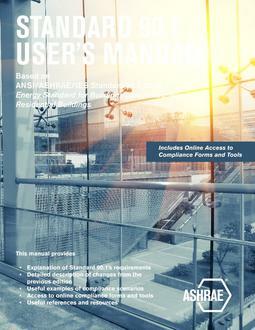 This 2007 edition of the standard has several new features and includes changes resulting from the continuous maintenance proposals from the public, including all of the Addenda to Standard 90.1-2004. The purpose of this standard is to provide minimum requirements for the energy-efficient design of buildings except low-rise residential buildings. 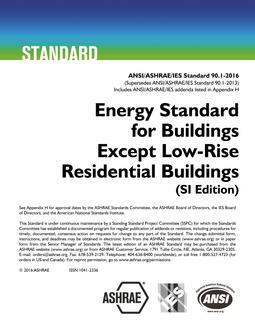 This standard provides (a) minimum energy-efficient requirements for the design and construction of 1) new buildings and their systems, 2) new portions of buildings and their systems, and 3) new systems and equipment in existing buildings and (b) criteria for determining compliance with these requirements. 2) cooled by a cooling system whose sensible output capacity is greater than or equal to 5 Btu/h ftÂ². The provisions also apply to the following systems and equipment used in conjunction with buildings: 1) heating, ventilating, and air conditioning, 2) service water heating, 3) electric power distribution and metering provisions, 4) electric motors and belt drives, and 5) lighting.The provisions of this standard do not apply to (a) single-family houses, multi-family structures of three stories or fewer above grade, manufactured houses (mobile homes) and manufactured houses (modular), (b) buildings that do not use either electricity or fossil fuel, or (c) equipment and portions of building systems that use energy primarily to provide for industrial, manufacturing, or commercial processes. Where specifically noted in this standard, certain other buildings or elements of buildings shall be exempt. This standard shall not be used to circumvent any safety, health, or environmental requirements.